Did the world owe Sarajevo? 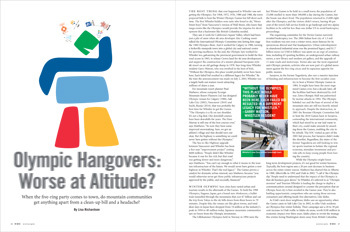 For Kootenay Mountain Culture’s Winter 2009 “Competition” issue, I investigated what an Olympic hangover looks like at altitude. Now, with just 78 days until the Winter Olympics rolls into Whistler, it seems fitting to look at what previous host mountain communities have gotten for their hospitality. Anyone who’s ever hosted a wicked party knows the morning after can be rough. The big question is: can the Games be more than just a billion dollar party? The recent resolution for an Olympic Truce seems a pretty blunt instrument for peace, given that Canada has no intention of pulling troops out of combat in Afghanistan during the Olympics. The Games had a real chance to put its money where its peace-proclaiming mouth is, in 2001, when the Bosnian Olympic Committee made a bold bid to bring the 2010 Games back to Sarajevo. Bold, given that Sarejevo’s fifteen year old Olympic facilities were in ruins. Zetra Olympic Hall had been pulverised in mortar attacks during the siege, land mines prevent access to the Olympic bobsleigh run and the city still cannot afford the electricity to keep the skating rink open. Bid president, Bogic Bogisevic proposed a moral campaign to win the Games. He argued that the international community had stood by while the City of Sarejevo was devastated by civil war. That failure to act could be repaid by awarding the Games to the city as a stimulus to rebuilding. But, as Olympic watchdog Chris Shaw told me in a later interview, the Olympics is not a moral event. It’s a business event. And the business case wasn’t there. The IOC visited Sarajevo as part of the 2001 bid process, but the city didn’t make the shortlist. Instead, the Games are coming to Whistler. Previous Post 1500 words on Whistler: ready, set, go!